Barbara is back on the streets of New York for her annual visit. She has been roaming the Lower East Side this frosty season, picking a new sidewalk each day. Admission is free, and her legal occupancy (though not posted) would seem to be about three grown adults. Taking a break for the holidays, her Big Apple tour ends January 5. Barbara, in case you haven’t heard, is the one ton, welded steel mobile gallery created by artist Marvin Gates. Three years after I first encountered her on a city street, I’m still startled by her originality and audacity. Parked on a Norfolk Street sidewalk (just feet from a commercial gallery), she could still be mistaken, at a glance, for a small-scale shipping container, or industrial strongbox. While bulkily elegant, and improbably clean, she still possesses a bunker-like presence. 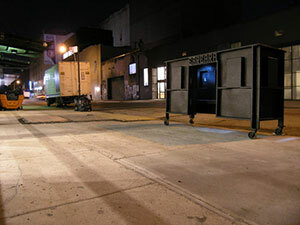 But then, what lesser structure could provide a sanctuary for art amidst the grit and noise of New York City? As before, the art on display within Barbara’s steel shell is surprisingly understated and delicate. Softly illuminated in niches lit by light bouncing off the pavement, the eight works on display, as Gates is happy to explain, are drawn from two series of works that he painted on small steel panels: the “Meander” series, composed of geometric, tessellated designs inspired by Egyptian art, and the “Seasons” series, which depicts simplified, suggestive images —a reindeer, a hand holding a blossoming plant, and (somewhat more ominously) a pair of handcuffs. Within the confines of “Barbara,” surrounded by the muffled rumble of passing trucks, the quiet precision of these works, with their thoughtful, somewhat otherworldly aspect, acquire a wistful resolve. Like “Barbara’s” physical location, the artworks change every day: perhaps the ultimate example of the gallery experience being brought to the people. Experiencing “Barbara” this time around, I was struck by how thoroughly its concept seemed amenable to the streets of New York – an over-charged city, after all, where everyone becomes an expert at finding solace where he or she can, and a place used to a kind of perpetual, semi-sanctioned street theatre. I was also impressed, once more, by the difficulty of the particular fight Gates has chosen. Making some kind of art would seem to be relatively simple these days—any quirky image, fashioned in an intriguing variety of media, reflecting a curiosity about the world and an alert concept, appears to qualify. (Of course, a great deal of art, like Gates’s, possesses far more than this.) The difficulty lies in penetrating the system by which these personal idiosyncrasies become salable commodities — that is, the art world’s system of commerce. In testing this, Gates seems to tackle head-on what is actually the greatest challenge for today’s would-be artist. He also challenges one of the chief presumptions of the art scene. The art world thrives on the pose of ornery independence, but does it truly want the real thing? Perhaps some of us do. And we’re encouraged by Gates’ hopefulness and determination, which seem as durable as Barbara’s steely walls.